Passenger lifts are – by far and away – the most popular installations we provide. Our clients range from hotels wanting to provide a scenic lift experience, to factories needing dual purpose lifts, or schools requiring enhanced disabled access. Whatever our clients’ passenger lift specifications, we start with a detailed needs assessment, and then create a unique bespoke design for them. Public Building Lifts – these are woven into the fabric of everyday lives in office blocks, shopping centres, public buildings, hotels, and leisure facilities. The frequent, heavy use to which these lifts are put requires that they are designed for maximum durability and safety. Residential Lifts – designed specifically for installation in a domestic environment, such as a residential or care home, residential lifts closely match the design aesthetic of their surroundings, provide a quietly efficient passenger experience, and fully comply with the Disability Discrimination Act. Platform Lifts – installing a platform lift is a popular way for public buildings to ensure access to facilities for people with impaired vision or mobility. Platform lifts can be installed in without a lift shaft and can enhance access up curved or straight stairs, over split level flooring, or in multi-floor buildings. Scenic Lifts – if you have an impressive view, scenic lifts are an excellent way to allow passengers to experience it. Each glass cabin is designed to maximise the view, whilst maintaining the highest levels of safety, durability and reliability. Dual-Purpose Lifts – for businesses and public buildings needing passenger lifts that can also carry goods, trolleys, or large pieces of equipment. These lifts are often bigger than a normal lift and are fitted with a non-slip floor, fully retractable doors, and utilise a machine room-less technology to allow for extra cabin height. For more information on any residential or commercial lift service, contact our team today on 01525 601099. The Tower Lifts design and installation team will always place the passenger experience at the heart of the bespoke lift design. Our aim is to create stunningly elegant passenger lift solutions that are capable of sustaining the daily wear and tear, whilst providing a smooth, quiet and efficient vertical transport experience. Passenger Safety is our number one priority. UK Lift Regulations stipulate that all lifts travelling faster than 0.15 metres per second must meet relevant health and safety requirements in their design, construction and installation. 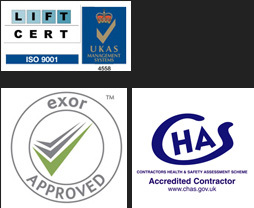 All Tower Lifts engineers have over 15 years’ experience in lift design, installation and maintenance and we are a ISO9001:2008 Lift Cert and UKAS Approved company adhering to all Lift Regulations. Once your lift is installed it’s important to keep it running at optimum performance. There are two reasons for this: First, as a lift owner you have a responsibility to ensure the ongoing health and safety of passengers. Second, passengers come to depend on lift transport and problems such as breakdown, or poor performance can cause them to lose trust and stop using the facility. Tower Lifts offers a range of lift maintenance and servicing packages, helping lift owners and managers to maintain an impeccable record for reliability and high performance. If you are thinking about having a passenger lift installed, call the Tower Lifts team for more information on our range of bespoke lift packages.